Not only the magical beauty of being perched on top of a hill at an altitude of 600 m with a breathtaking view of the Chiana Valley, with the bright mirror-like reflection of Lake Trasimeno in the distance along with the Sienese hills stretching as far as Mount Amiata, its ancient origins (which reach far back in time, so much so that according to legend its foundations have been attributed to Noah or Ulysses! 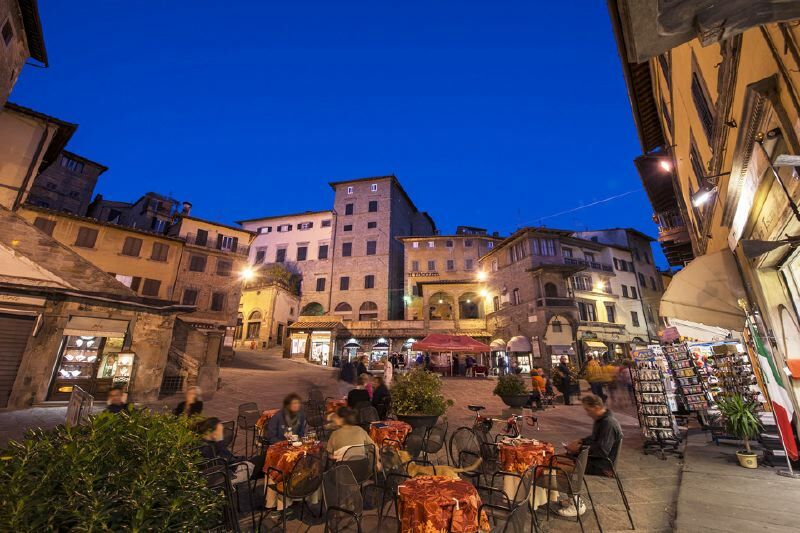 ), its strong Etruscan character (the town walls give us an idea of how important it was in that period) and combined with its strong Medieval imprint (the alleys that wind up to the top of the town) have created the fame of Cortona, but most of all for its lively, kind and genuine personality and its cultural viability (numerous art, gastronomic and cultural events take place all year round, such as the famous Tuscan Sun Festival with internationally famous artists) make it truly unique and one of the most fascinating and desirable places to spend a holiday in Tuscany. Casa Gilda offers you the rare opportunity of living in a typical Cortona-style house; this is where the owner's great-grandmother once lived, an eccentric nonconformist woman, descendant of a cultured family, who cultivated particular interests for their time, such as medicinal herbs, homoeopathy, astrology and photography. 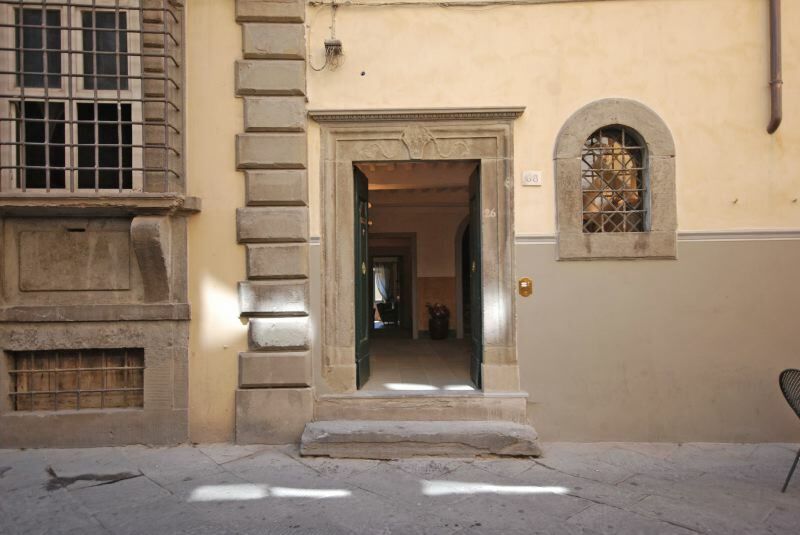 Situated at the beginning of the famous Ruga Piana, the town's "corso" (main street) and the its only flat street, the largest apartment has the typical vertical layout and as the fulcrum is a convenient stone stairway with cast iron handrail, from where the various areas develop out. Some windows overlook the central streets, the others overlook the valley with an incredible panorama. The owner has just finished renovating it, entirely preserving the original structure and adding value to its unique elements, furnishing it with a mixture of ancient traditional Tuscan pieces and original elements, modern and comfortable, which create a very cosy and welcoming atmosphere. The smallest apartment is on the ground floor and is accessed from a doorway on the street from the entrance, which is shared between the 2 apartments (the building consists of only 2 independent apartments that can also be rented together for a large group of people), has windows with views of the alley towards the valley and is just as pleasant and comfortable. 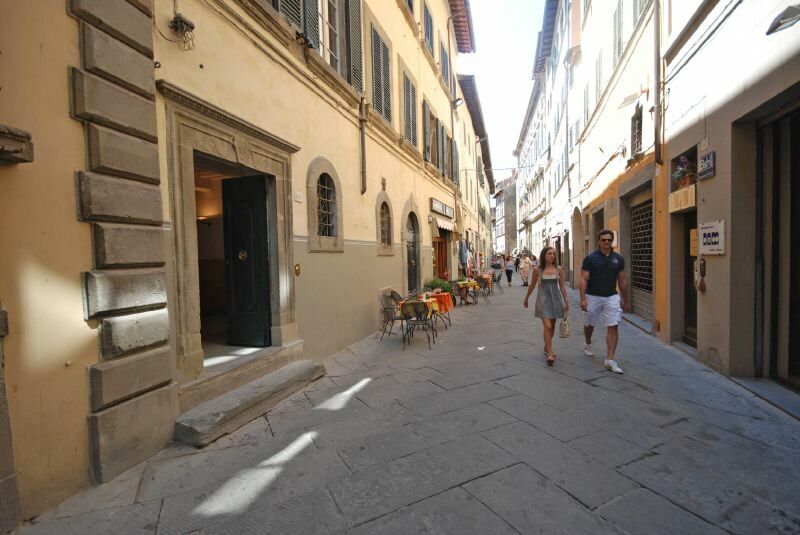 Casa Gilda is situated at the beginning of the pedestrian street in Cortona; the guests can unload their luggage 50 m from the house in the small square, where there is a car park and where also the escalator arrives, which goes up from the free car park below. Internet WI-FI. 2 ramps lead to the FIRST FLOOR: from the balcony on the right: 1 double bedroom with 1 private bathroom with double shower, in a passageway from the double bedroom 1 twin bedroom (both bedrooms with view of the alley in the back). From the balcony on the left (2 stairs): 1 double bedroom with windows overlooking the main street. going up one ramp (5 stairs): 1 small bathroom with WC, open shower and washbasin. 1 ramp (6 stairs) lead to the left to 1 twin bedroom under the eaves with small window overlooking the main street. 6 stairs lead to: small panoramic terrace equipped with table. GROUND FLOOR: 1 corridor, 1 living/dining-room with TV, double sofa-bed and view of the back alley from the windows, kitchen (dishwasher and oven), pantry with fridge, microwave and washing machine, 1 double bedroom with view of the alley, 1 bathroom with large shower.